*Above Picture Courtesy Yogesh Mhatre. Located at Neral (Malegaon) village on central railway route of Mumbai, Saugna baug is a private farm and agriculture location started by an Indian freedom fighter called ‘Harikaka Bhadsavle’. Its a 55 acres of green land that attracts picnic groups, other farmers and researchers to understand agro activities like horticulture, agro forestry, tourism (Agro-Tourism), aquaculture and other traditional and non traditional farming activities. An Ideal pollution free picnic location near Mumbai, full of lush greenery and village farms all around that gives a day break from the Urban life. Gain perfect piece of mind with family or friends group and rejuvenate yourself with the activities around. 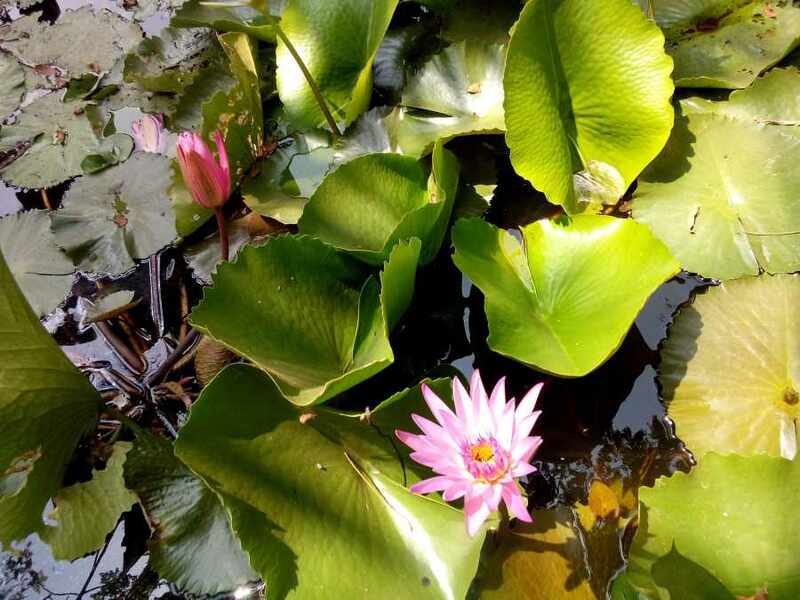 Saguna farms is blessed with 6 ponds and a natural flowing Ulhas river. 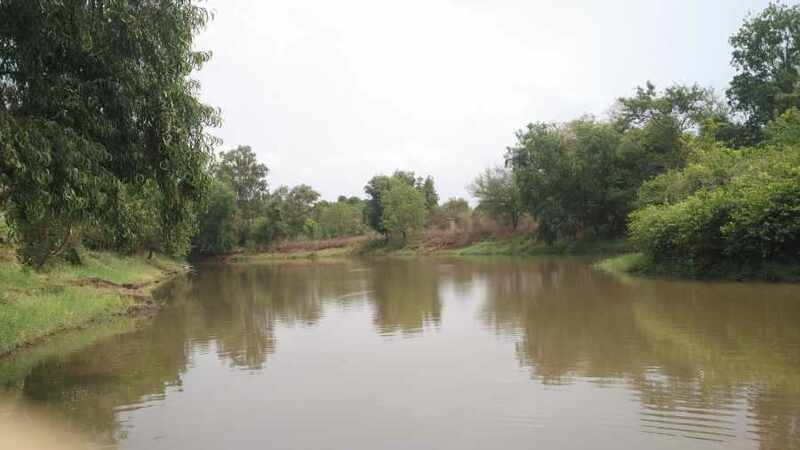 As said, This huge farm has total of 6 ponds filled with varieties of fishes all 12 months. So for those who are looking for fishing locations in / near Mumbai, Saguna farms satisfies your adventure need of catching fishes and taste few. Enjoy and experience many of those typical natural activities done in a village that is hardly possible in Mumbai city now due to fast growing Commercial activities, Economy and development with extra pollutions. Saguna farms is one of the very few picnic spots near Mumbai that gives a change of understanding the farming and agro activities. Some free leisure time can be spent to understand the farming, products and few medical plants and herbs. Its a fun activity and if never done, The feel of being with nature in farms is a must to be done at least once in lifetime at Saguna baug. At a special section, you get a change to get muddy and dirty to personally experience how gardening and farming is done. That sweating process is a day activity full of fun for you here. Saguna baug gives you a chance to become a ‘ONE DAY FARMER’, toil yourself, get dirty inside mud and experience how our farmers in India works and toils hard to provide us with the required foods and grains. Its a lovely experience to get into fields, cut grasses, feel the farm mud like a farmer does. Fishing : This is one of the only picnic spot with natural fishing activity inside 6 beautiful natural pons inside farm for all 12 months. 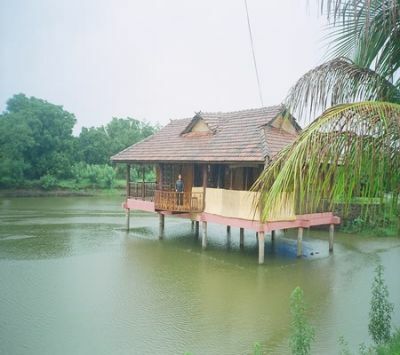 Monsoons brings in some big fishes in all filled ponds and fishing facilities are part of Saguna baug core fun activities. Rohu (Also known as ‘Labia’), Prawns, Cyprenus and Carla and few carbs available here. Only few natural ponds like Saguna baug has big Prawns available too. Swimming is a healthy activity, But how about swimming not inside a pool but at fresh flowing water of Ulhas River which flows and is available for all 12 months, Fun right. Although it is a safe place to swim and have all the picnic fun, Saguna farm staff keeps watch on you for your safety. This wonderful Ulhas river flows through farm location and is pollution free, clean and safe to enjoy. Truly, Very few such places are available in or near Mumbai city boundaries to enjoy a natural bath like this. Rod Fishing is what you will experience here. So get ready with your hooks, lines and sinkers with wheat or earth warms to lure those fishes out. Saguna farms have 6 awesome ponds and so is the fun of paddle boating in groups of 4 and 8. If you are here in vacations, holidays etc. then you might need to keep little waiting to get your round of boat ride at 6 of its farms ponds filled with fishes. Saguna baug is the only farm at Neral that gives you this special Buffalo ride inside their ponds. Safe and Calm buffalo are selected for this ride which is real fun. If you are not done with the adventures, Some inside farm activities and adventures are available to you with some extra cost. Air Rifle Gun Shots for all those obsessed with guns. A typical ride on the real bullock cart. Of course if you are from 90’s and stayed in or around some rural areas like Thane, Ratnagiri etc then you might have done these already in your early days, Its fun. Archery Shots : Hit the bulls eye and check your Archery skills at Saguna farms. Apart from all listed activities that farm provides, Few other activities are also possible which are optional, availability and few like waterfalls visits etc are seasonal. All these activities that are listed below will cost you extra and to be done on your own risk. Enjoying the special Adivasi group folk dance. Camping on village mountains which is bit risky and you be to be sure about your fitness. 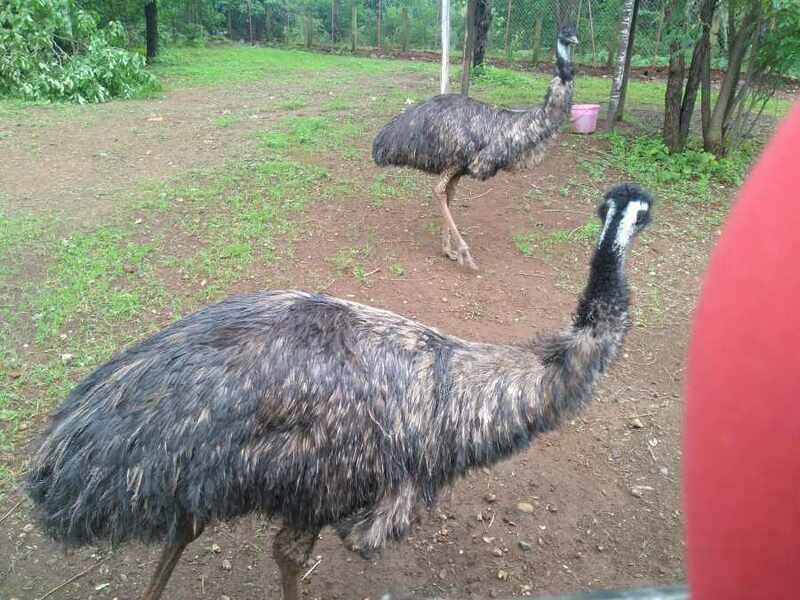 One of the very rare EMU farming near Mumbai. Emu’s are poultry birds comparatively larger in size which gives bigger eggs. Both eggs, meats and Emu farming is highly in demand now a days. Night camps can be arranges in those cold days to keep you warm. Other adventure activities like monsoon trekking etc as detailed in this article can also be arranged if weather and other conditions are suitable. If you are a bird watching lover, Mornings are awesome here. Before you leave farms at Saguna, You are provided with the fresh sea food (for Non veg Lovers) and fruits and dairy products to eat and enjoy the evening. From fresh sea fish to coconuts, fruits and dairy products they have it all to serve you and experience a typical village picnic fun. 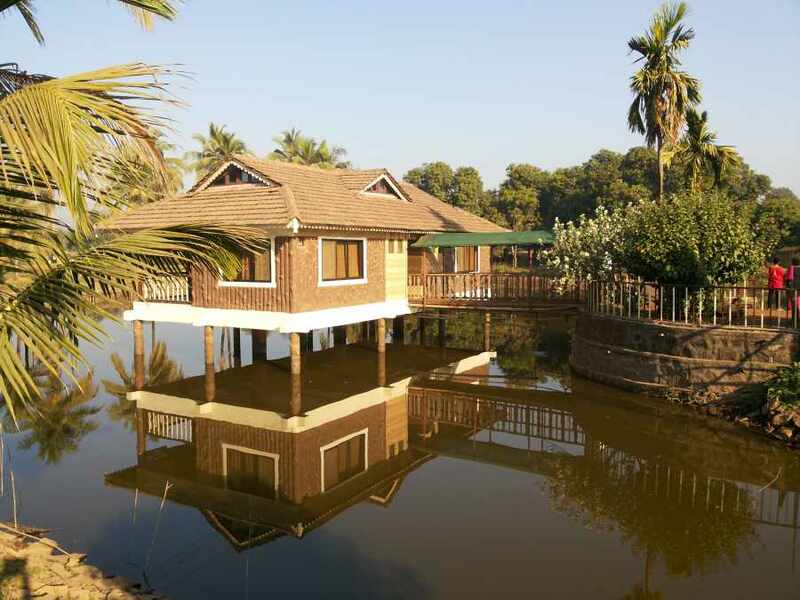 Saguna baug has Dormitories, Cottages, Bungalows, Mud and Pond House to stay overnight and also provide meal as per package selected. They charge per head and provide Lunch, Dinner and Breakfast which is included in the package. Their are discounts available for school/college picnic groups and members of NCC and NSS. More details on Stay facilities, various accommodation options and charges can be found here. Alcoholic Drinks are not allowed. Carry Some Mosquito and Insect repellents, even if they provide coils. Take care of your belonging as it is all on your own risk. First Aid Box is an ideal to carry for such farm locations. Since Saguna Baug is at Neral which is near to Mumbai, Railway and Road routes both are best options to travel and reach this farm house. Below are details about distance and routes for same. By Road : From Mumbai City Neral is 85 km, See Mumbai Neral Distance for more details and Map. If you are coming from Mumbai Suburbs below are some distance calculated that can help. By Train : Catch Any Central Railway Train from CST, Dadar, Thane, Dombivli, Kalyan Or Ambernath to reach Neral Station. This is the same station to reach Matheran , Checkout Mumbai Local Train Timetable for same. Want something similar within Mumbai, Head to Bhayander’s Keshav Srushti.